Where do I start? DHS members and the board have surpassed all my expectations. Having won the Doris Light heart award for % increase of members for 2015, we even increased memberships for 2016. (From 206 to 273). Our Junior gardeners program grew and thrived in our second year..
We handed out a total of 42 service pins, recognizing 23@5yrs, 8@10yrs,5@15yrs,4@25yrs and added one more life member. Now totaling 4 deserving women with over 141 years’ service between them. Sadly DHS lost two very important members of their board, lifelong friends Maura Cooper and Judy Jeffery. We gave out over 1000 packets of seeds at the Lions Home and garden Show. Donated seeds, vegetable plants and herbs to the Dunnville Community garden. Gave a donation to the Hwy of Heroes tree planting campaign. 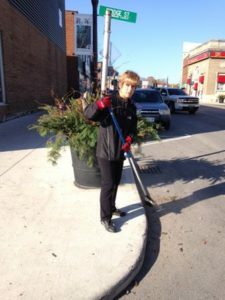 Over 200 trays of annuals, 66 grasses, 20 sedums, 15 shrubs, 56 ornamental kale and 750 special Canada 150 tulip bulbs in Dunnville’s public beds. Rehabilitated 2 large Welcome to Dunnville beds, complete with new decorative concrete edging, and new plantings of shrubs and perennials. Spread almost 50 yards of mulch throughout town beds. DHS Volunteers planted, weeded, maintained and oversaw all of Dunnville’s beds, planters and pots. Attended the annual Lions Home and garden Show, gave out seeds, offered mini gardening demonstrations, attracted and sold 83 new memberships. Respected Remembrance Day, by participating in ceremony and laying of wreath. 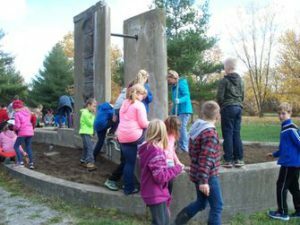 Partnered with two schools on projects (DSS and DCS) Haldimand County, the Rotary club and the Dunnville BIA. We garnered financial support and donations from over 73 local business, clubs, and organizations. DHS Exec and board members routinely attend public meetings, focus groups, and events to stay current on local initiatives. To be visible within community, provide feedback, insight and if within our mandate support. All are true ambassadors of DHS. Held 9 successful monthly programs, with record attendance. Public enjoyed speakers, refreshments, draws. Hosted a Niagara on the Lake winery and garden tour, enjoyed by all..
Held a members only open garden day, of 8 gardens show-cased by DHS members. The annual DHS plant sale, of which all items were donated garnered record profits in excess of $2000. 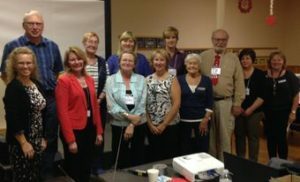 District 9 Doris Light Heart Award – for increased membership. DHS invited to attend and present, at the Mayors annual public Year In review. 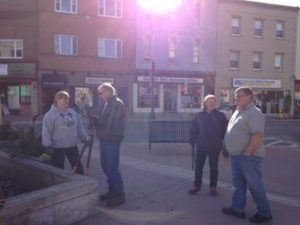 On DHS’s Restoration project of Dunnville’s Centennial Fountain. To be completed during Canada’s 150th year, the fountain’s 50th year. Merry Christmas everyone, and have a Happy New Year! See you in 2017! Doors opened at 5:30pm and a festival Christmas hall welcomed members and families to our Annual Christmas Potluck Celebration and General Meeting. Penny Sale tickets were available for early Christmas shoppers with over 50 generous donations from local businesses. Early memberships for 2017 were also on sale. 20 new memberships were sold. Food donations were received for the Salvation Army Food Drive. Photos were received and posted for the 4 Season Garden Photo Contest. 101 people signed in. President Debbie Thomas opened our evening with a warm greeting to all. Following the singing of “O Canada,” Geoff and Mary Lou Johnston sang a Latin hymn as grace for our meal. Everyone contributed to a delicious spread of potluck foods. After a hearty meal and conversation with friends, none other than Jolly ‘Ole Saint Nicholas dropped by to join our festivities. We moved into the business part of our gathering. Over 25 service pins were given out for 5 years, 10 years, 15 years, 20 years, and 25 years of continuous service. Betty Ballanger joined the ranks of becoming our Society’s 4th Life Member with 21 years continuous service. Congratulations, Betty! Our Junior Gardeners were recognized for their participation and hard work, especially during a very dry summer growing season. Margaret Bottrell presented the awards: Ist place gardens to Landon, Christina and Aiden Lucas. 2nd place gardens to Brennen and Ethan Dorland, Jennessa & Braden Melick. 3rd place gardens to Bralyn Schweyer. Honorable mention was given to Alicia Staving and Amiliana Sullivan. Congratulations to our young gardeners and thanks to their supportive parents. A special thank you and acknowledgment was expressed to Margaret Bottrell who ran the Junior Gardeners program by herself, after the unexpected death of her dear friend and long time DHS member, Judy Jeffery.Thank you, Margaret for your commitment to our Junior Gardening program. Secretary Sandi Marr presented the November 2015 AGM Minutes and asked for a motion to accept. Motion made by Wray McLean and seconded by Mary Lou Johnston. Carried. Treasurer Kim Christoff reviewed the Financial Report for 2016. Thanks was expressed to Lorraine Stevens and Joan King for their financial review. Motion made to pass the Financial Report and to accept Lorraine Stevens and Joan King as financial reviewers for 2017: Wray McLean and seconded by Margaret Bottrell. Carried. Debbie Thomas reviewed our very successful year with thanks to each person who contributed to DHS in a unique way. Our membership is large and strong. We have enjoyed outstanding monthly programs and many events throughout the year. 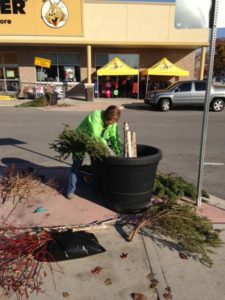 Our volunteers work hard to keep our town beds beautiful. We receive many words of appreciation about the care we give to town gardens. Together we keep our society strong as we move ahead into the future. Our biggest project in 2017 will be the rehabilitation of the Centennial Park Fountain. The 2016 Directors were recognized for their service and leadership. Farewells and appreciation were expressed to those leaving: Sue Mazi, Pauline Bradford and Ian Steel. Thank you to Sue, Pauline and Ian for significant contributions made. New directors were welcomed and introduced: Rob Marr, Denise Richardson, Petra Kruis-Daly. OHA District 9 official Lisa DeYoung swore in the new and incumbent Executive and Directors for 2017: Debbie Thomas (President), (in absence) Deb Zynomirski (Vice-president), Sandi Marr (Secretary), Kim Christoff (Treasurer) and 2017 Directors: Betty Ballanger, Gloria Hunter, Mary Lou Johnston, Marilyn Stavinga, Margaret Bottrell, Wray McLean, Rob Marr, Denise Richardson, Petra Kruis-Daly. We look forward to moving ahead with energy and vision. Debbie Thomas made a motion to approve the actions of DHS since the last AGM. Seconded: Barbara Whyte. Carried. Debbie Thomas made a motion to approve the actions and decisions of the Executive Officers since the last AGM: Seconded: Marilyn Stavinga. Carried. 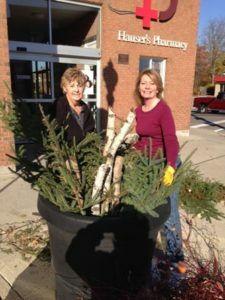 The 4 Seasons Garden Photography Contest winners were announced and honoured with gift certificates from Hausers Pharmacy. Summer: Mary Fretz. Fall: Mary Lou Johnston. Spring: Sandi Marr. Winter: Miranda Bucsis. Thanks to Gloria Hunter and Ian Steel for organizing this contest and to all who shared their love for gardening and photography. Our 2016 DHS Survey Winner was announced: Mary Fretz. Thanks to all who completed the survey in October and offered helpful feedback to the Board of Directors. Guest Speaker, Gary Cartlidge, Marketing & New Product Development Manager from Armstrong Milling was introduced. Gary spoke about understanding the wild bird seasons and how to optimize visits with the right food at the right time. 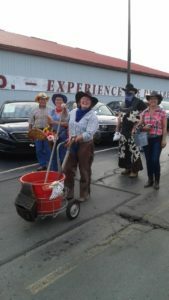 Everyone was given goodies bags filled with information, gift certificates, suet, and bird seed. DHS members will be keeping the birds fed well this winter. Special thanks to Minor Brothers, Grand Home Hardware and Armstrong Milling for making this possible. Penny Sale Winners were announced: Kim Dickie (5), Betty Clark, Sam Visser (4), Darlene Bucsis (2), Donna Cavers, Lauran (3), Mike Draaster, Cheryl Brown, Rose Marie, Marg Visser (3), Ellen Guenther (2), Bozak, Virginia S, Jenessa Melick, Dorothy Minor, Nellie Elgersma (3), Wray McLean (2), Denise Richardson, Rose Allen, Dorothy Minor, Joan King, Bruce Nevills, Claire Dvaastie, Marlene Link (2), Marie Boch, Steve Elgersma, Olga Nevills, Sharon Sykes, Maryanne Bruekleman, Debbie Thomas, Bev McLean. $380. was raised from Penny Sale tickets. Our generous sponsors for Penny Sale donations were acknowledged. Everyone was encouraged to visit our website at www.dunnvillehortandgardenclub.org to see a very impressive listing of our Sponsors for 2016-2017. Debbie Thomas invited us to shop local and support our local businesses. Thanks was offered to the Optimist Hall Ladies who decorated the hall and worked in the kitchen so everyone could be guests. The evening concluded with a heartfelt thank you to our many volunteers who make DHS a continued success. Everyone was dismissed with wishes for safe travels and a healthy, happy new year. We hope to see everyone back on January 19, 2017! Dunnville Horticultural Society (DHS) is not slowing down. 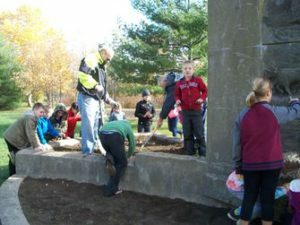 The “Town-wide bed cleanup day held Oct 22 saw 30 hardy volunteers out, pulling annuals, weeding and tiding beds. Special thank you to “Jeff’s Lawn Care Inc.” for supplying their truck and trailer to haul away all garden debris. So much time was saved. There was no need to bag or make multiple trips to the dump for composting.Thanks, Mike Lessard. Cheryl from “Flyers Bakery and Cafe” treated all volunteers with freshly baked carrot muffins and hot coffee, when the work was done. DHS members also planted 56 ornamental kale in the Downtown area. 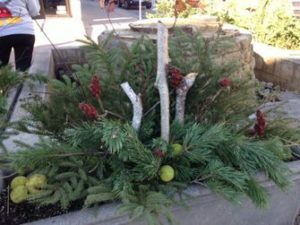 These were generously donated from “Garden Gallery” to add seasonal color and interest to the gardens. The “East and West Welcome Signs” were planted with over 500 red and white tulips. Special “Canada 150 tulips” were planted in the beds on either side of the Bridge entrance. 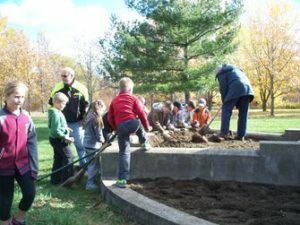 Another 500 special “Canada 150 tulips” were planted with the assistance of students from Dunnville Christian School (DCS) around the base of the Centennial fountain in Centennial Park. 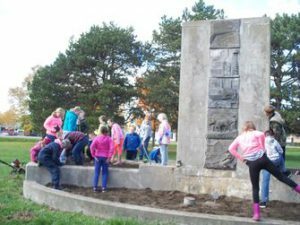 DHS, in partnership with Haldimand County and DCS plan to have the Centennial fountain restored for its 50th anniversary which also corresponds with Canada’s 150th anniversary, next year. This is by far the largest project DHS has taken on. Plans of the restoration are underway and updates will be publicized along with fundraising efforts. On Sat. 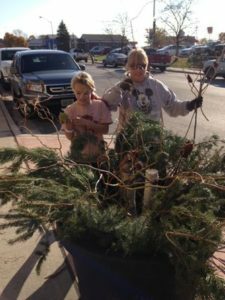 Nov 5th, DHS volunteers came out once again in full force, decorating the 24 large pots and town fountain for Christmas. 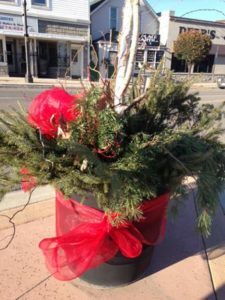 The boughs were donated from “Evergreen Acres Landscape & Christmas Trees.” Red bows will be added by the Dunnville BIA after Remembrance Day. Thursday, Nov. 17th is DHS final program of the year. 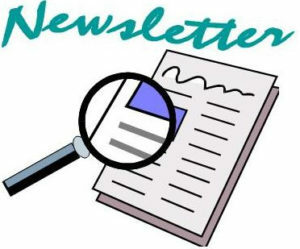 It’s a full evening including: the Annual General Meeting, Annual Christmas Celebration/potluck, Community Food Drive, Junior Gardeners Awards, Penny sale table, and special guest speaker Gary Cartlidge, Armstrong Milling, Dunnville on “The right food for the right bird at the right time”. 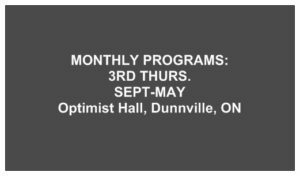 Program begins 6pm at the Optimist Hall.This is a members-only event. Regular DHS monthly programs are always open to the public and will resume Jan. 19th 2017. 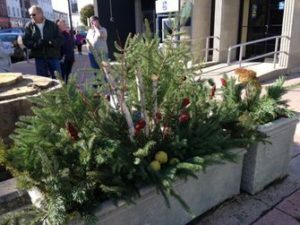 A BIG THANK YOU TO THE VOLUNTEERS THAT CAME OUT TODAY TO DECORATE DUNNVILLE’S POTS AND FOUNTAIN. Thanks also to those who collected/brought in items for the pots. A big thanks to Evergreen Landscape and Christmas tree farm for supplying greens. The pots look beautiful! Thank you: Kim Dicke, Marlene Link, Alicia Stavinga, Marilyn Stavinga, Gloria Hunter, Kim Christoff, Rob & Sandi Marr and Debbie Thomas. It was especially nice to interact with the public this morning. We received many smiles and words of appreciation to DHS members for their contributions to the beautification of Dunnville. 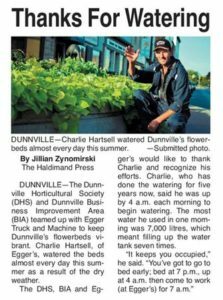 The Dunnville Horticultural Society (DHS) and Dunnville Business Improvement Area (BIA) teamed up with Egger Truck and Machine to keep Dunnville’s flowerbeds vibrant. Charlie Hartsell, of Egger’s, watered the beds almost every day this summer as a result of the dry weather. The DHS, BIA and Egger’s would like to thank Charlie and recognize his efforts. Charlie, who has done the watering for five years now, said he was up by 4am each morning to begin watering. The most water he used in one morning was 7,000 litres, which meant filling up the water tank 7 times. 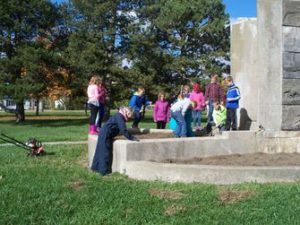 On Friday, Nov. 4 the children from Dunnville Christian School (DCS) and their teachers gathered with DHS volunteers to plant tulip bulbs as part of the Centennial Park fountain restoration project. The fountain, built 1967, will be part of the 50th anniversary celebrations next year 2017. This is a joint project with the partnering of Haldimand County, DHS and DCS. November welcomes us with falling leaves and cooler temperatures. For gardeners, leaves are like gold. 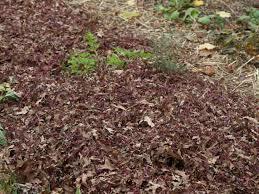 Shredded leaves are one of the best mulches nature provides. While shredding leaves requires a little extra time, the result is worth the effort. Before we batten down the hatches for winter, let’s consider why we might shred our leaves. 10. They are free and you make friends by picking them up! To shred your leaves, run your power mower over your leaves after you have heaped them up about 20 cm high. Raise your lawn mower to its highest setting before you do this. Rake up the mulched leaves, which will have been reduced to less than 5% of their pre-mulching volume and place in your compost bin or bag them for spring. When spring arrives, spread your decomposed shredded leaves on your garden. Or simply rake the leaves off your lawn and onto your garden. Just leave them there to rot. They become fodder for earthworms, which convert them into nitrogen-rich worm castings which are good for everything that grows. By fostering a healthy earthworm population, your garden soil will ‘open up’ as they tunnel their way to and fro, allowing oxygen to move into the root zone of your precious garden plants. 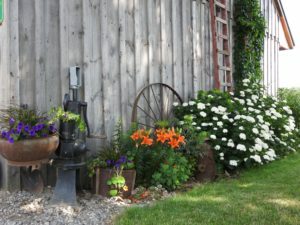 For these and more great gardening tips, visit our updated website at www.dunnvillehortandgardenclub.org. Be sure to check out our 2017 Event Calendar. We have an exciting line-up of monthly program speakers including: Hanna Jacobs, Matchbox Garden & Seed Company, Caledonia; Karen Buschert & Moritz Sanio, Grand River Conservation, Cambridge; David Culp, Niagara Bonsai, St. Catharines; and Lester Fretz, Lowbanks/Port Colborne. Dunnville Horticultural Society has been around since 1929 and continues to be a vibrant, growing group in our community. Calling all photographers and gardeners…. Everyone is invited to bring photos for our “Four Seasons Photo Contest” to our November Monthly Program Night & Potluck, 6-9pm, Nov. 17. Everyone is invited to submit 4 photos, 4 by 6 inch size prints. Photos must be of horticulture & gardening significance from the Dunnville and surrounding area where members live and garden. Kindly identify your photo on the back with your name and season (spring, summer, fall, winter). Please do not submit photos of your pets or wildlife or trips you have taken. We want to see YOUR garden and flowerbeds in their fully glory. Members will vote for their favourite photos. For more information contact Gloria Hunter, Debbie Thomas, or Deb Zynomirski.